My most common reaction to various artist 'tributes' and 'covers' albums - I usually avoid them. Maybe 20 years ago, I would have been more apt to give one a look or listen, but over the last few decades, there's been so many tributes and covers albums released that I've lost count. To be honest, I think I lost all interest in them the moment a band would have a hit debut album and within months, there'd be a Goth tribute, a Bluegrass tribute, etc. Come on.... why pay tribute to a band with only one album in their catalog? My main problem with most tribute and covers albums over the years is that the artists didn't always 'connect' with the material. They either tried too hard to change the material to suit their particular style... or they didn't try hard enough and the results were lacklustre. And isn't a tribute album all about honoring the music or artists that inspired you? Over the years, tribute albums became nothing more than a quick money grab. So, for months, I've been hearing rumblings of a tribute to the glorious Lite Rock that I grew up on in the '70s and '80s. What is Lite Rock? Well, some call it Soft Rock while others think of it as AM Radio Rock. Basically, think of Player's "Baby Come Back", Rupert Holmes' "Escape (The Pina Colada Song)", Randy VanWarmer's "Just When I Needed You Most", and many of the other melodic hits of the era. Lite Rock artists wasn't mellow enough to be classified as Easy Listening/Pop (Olivia Newton John, The Carpenters) but they weren't as ballsy as many of their Classic Rock brethren (Journey, Foreigner). It was a style of music that appealed to wide range of music fans, young and old. It wasn't rebellious - it spoke from and to the heart. When I read about some of the indie Power Pop artists attached to the project, I felt that there was hope. I'm a guy who is passionate about his music. I don't create music (you're welcome) but I'm passionate about what I listen to and how it moves me. So, I was more than interested to see how a talented group of modern artists would approach some of Lite Rock's finest musical moments. I've always felt that the artist covering a classic song should be comfortable in doing so. They should wear that song proudly like it was a new suit instead of their big brother's hand me downs. They don't have to be flashy - they just have to make it feel like it belongs to them. 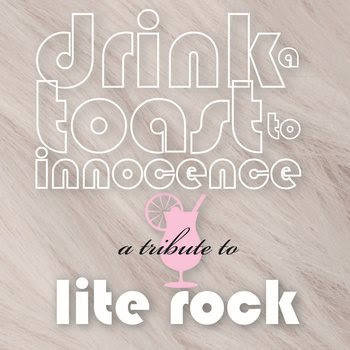 Well, I'm glad to say that Drink A Toast To Innocence: A Tribute To Lite Rock works on all levels and is pure f***ing genius! From song selection and artists right down to the actual recordings, DATTI is one of the few tribute albums that understands the concept behind 'tribute' and executes it perfectly . And it just so happens to be the first 'tribute' album in 20 years that I've sat down with and played over and over again. Yeah, it's that good! LINUS OF HOLLYWOOD now owns "More Than I Can Say". The song is great (of course), the arrangement is great and LOH's vocal performance is stunning. My apologies go out to Leo Sayer, but I feel that this is pretty much the definitive version of the song now. Did MICHAEL CARPENTER write "We Don't Talk Anymore" for Cliff Richard? Because I'll be damned if it doesn't sound like it. Carpenter remains one of the most underrated Pop artists on the planet and has written and recorded some of the best Power Pop songs of the last 20 years or so. And like anything else he's involved with, he puts 100% of himself into this recording. Funny thing is that his original material is just as good (if not better) than "We Don't Talk Anymore". SETH SWIRSKY takes Henry Gross' "Shannon" and proceeds to break your heart (hell, that seems to be a theme with many of Lite Rock's finest moments). Seth's name has been in the news lately because of his most excellent documentary Beatles Stories, but he's been a successful songwriter and author for ages. His best work (in my humble opinion) is not the hit songs he's written for the likes of Taylor Dayne and others... no, his best songs are featured on his solo albums and those with The Red Button. And now, with "Shannon", too. Damn, this guy's got more talent than anyone you've listened to this year! There are so many great things to love about this release that I don't have the time or space to list them all.. and I've probably said far too much already. But, for me, the sign of an album that hits all the right notes is that your favorites change from day to day. With DATTI, my favorites change from listen to listen (and that means quite a bit over the last few days). Maybe a year from now, I'll finally decide with tracks are my favorites from the album, but for now, You can't go wrong with any of them. This is a tribute that pays homage to the songs that inspired the very musicians that are playing on the album. It is an collection that will delight fans of the original versions of the songs, followers of the artists appearing on the album and will also turn a new generation of listeners onto some great tunes and artists. Just like Lite Rock itself, this is music from and to the heart.